NYC.gov are using Street View to provide citizens with a unique new way to report local problems and to gather public feedback along Fourth Avenue in Brooklyn. What needs improving on Fourth Ave in Bay Ridge? allows users to explore Fourth Ave on Google Maps Street View and add a comment directly to the image of where they think problems exist or where they believe the city could make improvements. The comments added to the application so far include problems with street lighting, double parking, problems with crosswalks, wrongly positioned speed-bumps etc. The Street View interface is a working example of OpenPlan's Fitzgerald application. Using Fitzgerald, people can annotate Street View imagery to provide detailed, highly-specific comments about places. Administrators can then review comments and at the same time see exactly what the person was looking at when they left a comment. Click on the numbers beneath the Street View to teleport to a new location. You can press the 'stop' button if you want to manually pan the Street View. I've removed the navigation arrows from each Street View, so if you want to walk around just click on the Google Maps logo to open the Street View in Google Maps. Google has added a lot more Street View imagery to Google Maps, including some amazingly beautiful panoramas taken in the Grand Canyon. Street View is also now available in Lithuania. To capture the Grand Canyon imagery Google devised the Trekker, a backpack-sized Street View camera system. The trekker even makes an appearance in the new Grand Canyon imagery. If beautiful landscapes are your thing then you should also check out the new Street View imagery on the ski slopes in Aspen. Travelling a lot further east you can now also explore the historic Lithuanian town of Vilnius, including the pretty Vilnius Cathedral. The second most spoken language in the UK is Polish. Thanks to The Guardian's Language Map it is now possible to visualise the geographic distribution of different languages in England and Wales. Using the language data from the 2011 UK census The Guardian has created a Google Map that allows the user to view the percentage of speakers of different languages in each census tract in England and Wales. Users can click on any census tract to view the breakdown of the main languages spoken or they can select a language from a drop-down menu to view a heat map of the language's distribution throughout England and Wales. In Canada Global News used the language data from the 2011 Canadian census to also create a mapped visualisation of the leading mother tongues by census tract. The Google Map allows users to view the percentage of different language speakers in each of the major Canadian cities. The map also includes other census topics, such as age, gender, number of children etc. Chicagomag.com has used census data to create two Google Maps looking at Chicago's Second Languages. One map looks at the areas with the most English-as-a-second-language speakers. The other map shows the dominant non-English language in each area and the percentage who speak that language. Both maps were created using Google Fusion Tables. The SBS - Census Explorer is a data exploration tool visualising the key demographic indicators from Australia's 2011 Census. The tool allows users to explore the census data in a number of different ways. Google Maps are used throughout the Explore Languages section of the Explorer to visualise the locations of the 579 different languages spoken throughout Australia. Using a drop-down menu it is possible to select an individual language. A heat map of where that language is spoken is then displayed on the map. It is possible to click on individual census tracts to get the exact number of the language's speakers at that location. Here's a map for nostalgic computer game players. Super Metroid - Zebes is the first Google Map of a platform game that I've seen. Super Metroid is set on the planet Zebes and this map lets you explore Zebes in all its 2d vintage glory. In truth this map is at the other end of the scale from the truly great computer game map mashups, like the amazing Grand Theft Auto IV Map. Whereas the Grand Theft Auto IV Map lets you explore the 3d world of Liberty City in Street View, the Super Metroid Map is just a straight forward image map. However Super Metroid was voted the Best Game of All Time in 2003 by Electronic Gaming Monthly and I'm sure this map will bring back a lot of pleasant memories for many gamers. Vasile Cotovanu has used his popular vehicle-simulator library to create a real-time simulation of the Grenoble public transport system. The TAG Grenoble Network Simulator is a real-time simulation of the trams and buses of Grenoble based on the published timetables. The Google Map shows all the trams and buses in the city moving in real-time along their designated routes. The map uses the Stamen watercolor map tiles. Belfast Maritime from the Northern Ireland Community Archive is an interesting look at Belfast's maritime history which includes a clever implementation of the Google Maps API. The story of Belfast's maritime history is told in one scrollable column on the page, whilst important locations discussed in the narrative are displayed in a Google Map that is held in another static column. Therefore as the user scrolls through the text the map remains in place. When locations are mentioned in the text or shown in photographs the map updates to display the relevant location. The red markers on the map indicate the current location being discussed. Housing.co.in is a Google Maps based real estate engine for Mumbai in India. Currently the site allows users to search for rental properties. It is possible to search by price, location and by furnished or non-furnished properties. The site also has plans to expand to offer properties for sale. WXTiles is an API providing free weather forecast overlays for use with Google Maps and OpenLayers. The overlays all use data sourced from NOAA. The Art Spaces :: New Museum Directory is an international guide to over 400 independent art spaces from ninety-six countries. The directory includes a well designed Google Map that allows users to browse the art spaces by location. It is possible to search the map by country or by activity. The activities include art fairs, events, conferences and many other events of interest to those who love art. If you want to know more about an individual entry on the map just click through to view the institution's dedicated page on the New Museum Directory. The directions service in Google Maps allows you to get driving, walking, cycling and public transit directions for any journey. However it doesn't allow you to compare all four modes of transport side-by-side. Side-bySide Router does show all four routes on one Google Map, so that you can tell at a glance which is your best option. Above the map you can view the distance and the time taken for each mode of transport. It is therefore a a pretty handy guide to whether a journey is easy to walk or would be better by bike or that it looks like it might be worth taking the car or public transit. It is becoming fairly common now to use Google Maps Street View in online promotional campaigns. This week Google Maps Mania reviewed two very good examples of how Street View can be used to engage the attention of potential customers. The Prius Plug-in Virtual Drive is a clever online campaign to promote the capabilities of the Prius Plug-in Hybrid car. The campaign uses a combination of Google Maps and Street View to show how far Toyota's hybrid car can travel on any journey in EV mode (Electric Vehicle) before switching seamlessly to the HV mode (Hybrid Vehicle). To use the app the user can enter any starting point and any destination.The first part of the journey, which would be completed in EV mode, is shown virtually using an animated series of stereographic Street Views of the route. The second part of the journey, which would be in HV mode is shown on a Google Map. If you want to see more impressive experiments with Stereographic Street View then check out the axamples on the streetview-stereographic code page on Github. Foot Locker and Converse have also created a clever Street View game to help promote their brands. The game involves wandering around the streets of London, Paris and Milan searching for hidden Converse Pro Leather Vulcs. Converse Street Ready requires the user to virtually walk the streets of the three cities following the visual clues to the hidden baseball boots. As you play the game you are rewarded with free downloadable tracks. There is also a grand prize of a trip for New York up-for-grabs for one lucky winner. Low cost airline Flybe has released a nicely designed Google Map to show where their planes fly from and where you can fly to. You can select any of the airports marked on the map and view a visualisation of all Flybe flights from that airport. If you select one of the displayed destinations you can click through to view prices and even book your ticket. The map makes good use of the Styled Map option in the Google Maps API to create a map that reflects the colours of the Flybe livery. The National Weather Services Enhanced Data Display is an experimental Google Maps based display of current and forecast weather conditions. This isn't just your average weather map but a full GIS-centic interface with hundreds of weather related layers that can be viewed on the map. Users can add a number of NWS data layers to the map, including radar, cloud cover and webcams. Forecasts for any location can be accessed by right-clicking anywhere on the map. Hundreds of other weather data layers can be accessed by clicking on the 'more layers' link in the map sidebar. You never know when someone might be using Google Maps Street View. So you should take extra care these days when crossing the street and keep an eye out for any approaching Pegman. What do you buy the bird that has got everything? Might I suggest these rather nice Google Map marker birdhouses. Not only do they provide attractive and cosy accommodation for the modern city bird they are a great guide to migratory navigation. 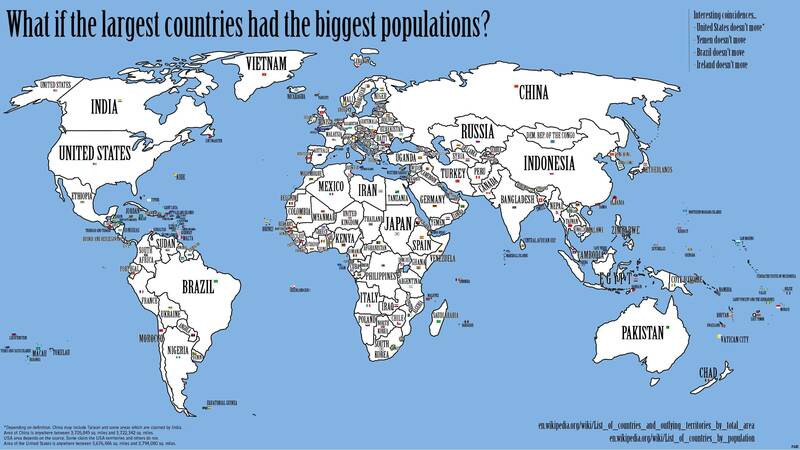 What if the Largest Countries had the Largest Populations? re-imagines the world atlas, placing the countries with the biggest populations in the countries with the largest land mass. That seems an eminently sensible suggestion and I can't foresee any problems with such a plan. I for one fully support the idea of the UK moving to Niger, if only to escape the incessant rain. HamOntFire is an interesting Google Map that is visualising the tweet reports of the Hamilton Fire Service, @HFS_Incidents. The map itself isn't that pretty but there are some clever things going on under the hood and the map is accompanied by a detailed explanation of how it works. You can also view the source code at BitBucket. Essentially the map is parsing the latest Hamilton Fire Service tweets for locations and then geocoding the locations and adding them to the map. Google Street Scene is a Tumblr of iconic scenes from movies re-imagined as Google Street View images. The scenes all seem to be stills taken from the original movies with the navigation aides from Google Maps Street View superimposed on top. At first I thought this was kind of fun but a little pointless. I do like that the name of each film isn't shown so you can try and guess the movie and click the 'source' link to see if your guess is correct. I then noticed that each image also includes the address of the location where the actual scene from each film was shot. So if you are a complete Street View addict like me you can enter the address into Google Maps and view the location actually on Street View. The Mobile Bay Activity Finder is a great Google Maps based guide to places to stay and things to do in Mobile Bay on the Gulf of Mexico. The map includes three categories of locations useful to anyone visiting the area; 'activities', 'stay' and 'services'. The sidebar menu is really nicely implemented. Each category includes a number of subcategories and each subcategory can be added or removed from the map using a simple on/off button. Each subcategory can also be subcategorised by simply clicking on its name in the sidebar menu. For example, under 'activities' you can view all 'attractions' on the map or you can select 'attractions' and select individual subcategories, such as 'churches' or 'museums' to view an individual subset on the map. Inspired by the Prius Plug-in Virtual Drive and its clever use of stereographic Street View I've been looking once again at the streetview-stereographic code on Github. I thought I might try and experiment with the code and see if I could create a spinning stereographic Street View. In the end however I get distracted by some of the wonderful experiments that others have already done with stereographic Street View and which the github for stereographic-streetview helpfully provides links to. ReRouteMe is a powerful route planning application for Ottawa, Toronto, and many other southern Ontario communities. The app helps drivers reduce travel times based on highly accurate, local, current conditions. ReRouteMe gathers local data about construction, traffic conditions and weather, which it then uses to determine the optimal route. Registered members of ReRouteMe can also save their planned routes and ReRouteMe will notify them in advance if anything affects their trip. As well as displaying suggested routes a number of other useful information can be added to the Google Map. These include local gas prices, weather, planned road works and live streams of traffic cams. Yvan Rodic's work as a street fashion writer has taken him all over the world. During his travels Rodic has taken some amazing photographs of both street fashion and at some of the world's leading fashion shows. Yvon Rodic - Cities is a mapped interface to Rodic's photography that allows the user to navigate his work by country and city. The map was created with the Google Maps API and MapBox and provides a well designed and intuitive way to explore Rodic's extensive fashion photography. Foot Locker and Converse have created a clever Street View game to help promote their brands. The game involves wandering around the streets of London, Paris and Milan searching for hidden Converse Pro Leather Vulcs. Low cost airline Flybe has released a nicely designed Google Map to show where their planes fly from and to where. Zee.gr is a nice Google Map to help Greeks easily get around Athens (and beyond) by public transport. Users can use the map to plan a journey on Athens' public transport system and quickly view the available transport options from a starting point and destination at a specific time of day. The map also includes a handy 'Route Explorer' tool that allows users to view specific routes, schedules, departure times or discover all public means of transport from a specific location on the map. To use the Route Explorer the user just needs to right click on the map and all available routes from that location will be displayed on the map. The Bear Tracker from Polar Bear International is tracking the movements of polar bears in Hudson Bay. The Google Map shows current and past sea ice levels on Hudson Bay, and also the rough locations of polar bears. Users can click on the individual polar bear markers to view the bear's track and also use a time slider control to see the locations of the bears over time. The Nova Southeastern University Oceangraphic Research Center are using Google Maps to track a Mako Shark named Carol. The Shortfin Mako Shark Tracks map allows the user to view Carol's movements over the last seven months, as she has explored the Tasman Sea and South Pacific Ocean off the coast of New Zealand. The map also includes the option to view an animated track of Carol's journey over the last seven months. Ocearch are tracking the position of a number of sharks off the coast of South Africa. The Global Shark Tracker allows anyone to observe the navigational pattern of the tracked sharks.The sharks have been tagged with satellite tracking technology for the purpose of shark conservation and their movements can be followed on this Google Maps based tracker. Currently 34 sharks are being tracked in total and you can follow them all with the tracker. The tracker includes a number of useful filters which allows the user to search for individual sharks by name or to view the trails of just male or female sharks or of mature or immature sharks. Stayz is a handy Google Map for anyone looking for holiday rental accommodation in Australia. Users can search the map for property by location, by date, by price and by number of beds. If you select a property on the map the information window provides a quick view of the price per night and user ratings. If a property appeals to you then you can click through to view further details about the selected property. Rankers > Respect NZ has used the Google Maps API to map every New Zealand campsite and a range of outdoor activities that you can undertake in New Zealand's beautiful great outdoors. You can select to view 'campsites' or 'top rated activities' by clicking on either of the two buttons above the map. If you select to view campsites on the map you can zoom in on individual markers and mouse-over to view the available facilities and view the average user review of the campsite. If you select the activities option the map markers show the location of walking routes, with information about track lengths and user ratings. Hopefully in the next couple of years Google's augmented reality spectacles Google Glass will be available in the marketplace. Until the commercial release of Google Glass however we will just have to pretend we have augmented glasses by using the new Astoria app. Astoria allows you to virtually walk down the road, using Google Street View, and view geotagged content from Instagram, Yelp and Twitter superimposed upon your view. The result is a little like what I imagine the experience of wearing Google Glasses will be in the real world. As I can't be in the capital I shall be using Astoria today to virtually walk around Washington, D.C. to view the latest Instagram photos and Tweets posted about Inauguration Day. When I first heard about Slur Tracker, a real-time Google Map of rude Twitter messages, I thought that it sounded like a lot of fun. Something about the thought of watching a constant stream of insults on a Google Map appeals to my sick sense of humour and love of cartography. Unfortunately the app just leaves me feeling depressed about the inane stupidity and the homophobic and racist attitudes of many Twitter users. After viewing a succession of little white boys calling each other fags and thinking it's cool to use the N-word I realised I wasn't going stumble upon the wit of someone like Dorothy Parker or Oscar Wilde on Slur Tracker. This is of course no fault of Slur Tracker, which is a nicely realised and designed real-time Twitter map. Instead I blame my ephebiphobia.